Bring the whole family to the zoo and enjoy the thrill of camping in our Serengeti Safari. 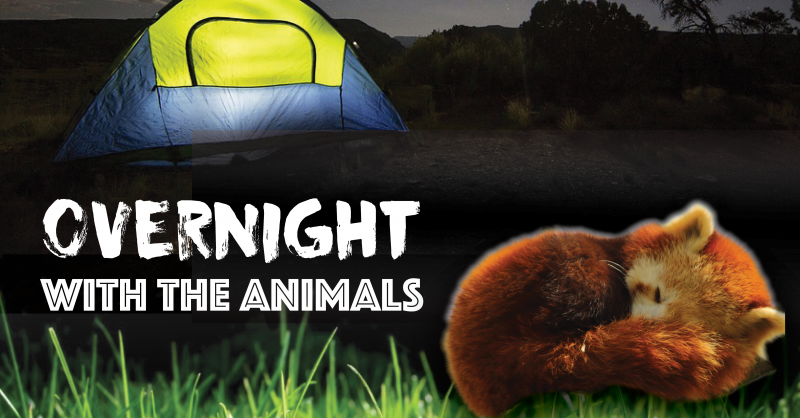 Your adventure includes dinner, camp games, an exclusive tour, stargazing with Southern Colorado Astronomical Society, continental breakfast in the morning and admission to the zoo all day Sunday. Register by August 7th at 5pm. *Campouts are outdoors. We recommend overnight campers be at least 5 years old and all children must be accompanied by an adult. Check-in will be from 5:00 – 5:30 pm at the front gate of the zoo. If you find that you will be late, please make an effort to contact the Zoo’s reception area (719) 561-1452 ext. 100 during standard business hours. If you have additional questions about the program, please call (719) 561-1452 x103. Clothing: Participants need to dress comfortably, with a jacket appropriate for the weather and sturdy walking shoes. Campouts are outdoors. We may have a limited supply for use! As a part of the registration fees, the Zoo will provide each participant with dinner and beverages, as well as a continental breakfast. You may bring additional snacks and beverages (no alcoholic beverages), if desired. Please let us know, when you reserve your date, if any participants have special needs and we will do our best to accommodate.